Sooner or later, every beginner guitar player hits a wall or two in their playing... a tough skill that won't be easily mastered. One of the biggies is Barre Chords! If you're reading this, you probably know what a barre chord is, but just in case you don't: a barre chord is a guitar chord that is played up the neck, using your index finger to "barre" across the whole neck (sort of a portable capo formed by your index finger). They offer such a challenge that you might be tempted to just skip this skill and play the songs that can be played with easy "open" chords. Hey, what's so great about those sour grapes anyway? 1. Portability-- they allow you great portability up and down the whole guitar neck. This lets you switch between chords and the scales that go with them instantly. If you want to throw in a lick around the 10th fret right after an open "G" chord, you'd have to move lightning fast and if you did, you'd still have good chance of an embarrassing mistake. But if you're already at the 10th fret, making a "G" barre chord, you're golden! 2. 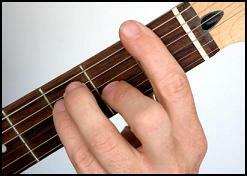 Distinct Sound-- Barre chords don't have the same jangly, ringy sound that open chords do. Because all the strings are fretted in a barred chord, they sound "tight" or even "controlled". And because you usually play more than one barre chord in a song, they offer a kind of uniformity of tone between chords. Because your index finger is in contact with all the strings across the neck, you're able to completely damp the strings in a nano-second. This lets you create lots of great percussion sounds between chords. Chikka chikka chowwww! 3. Ease of Use (Once you've learned them, that is)-- Barre chords have the advantage of letting your fretting hand make a lot of different chords even while keeping your fingers in the same relative position (the same chord shape). They also let you switch from chords to solo notes with the same basic shapes. All in all, they give you LOTS of new tone colors to paint with when you're playing guitar... and all from learning a singular skill. So, yes. They are worth the trouble to learn. SO HOW DO I CONQUER THEM? Barre chords are such a challenge at first for ONE SIMPLE REASON: Unfamiliar muscle memory... especially in your index finger. You're index finger just isn't accustomed to doing this particular job using these particular tiny muscles. What do I mean? Your hands are used to gripping--curling your fingers around an object to hold it fast. But the action needed to make a barre chord is NOT a gripping action. Your index finger is going to have to learn a new skill... something more like "mashing" or "clamping" (with some assistance from the thumb on the back of the neck). First, the index finger has to stay straight even while it's "working". This will feel very strange at first and your finger will keep trying to return to its default "curling" position. A good exercise is to just put your index finger across the neck at maybe the 7th fret and train it to hold the top string (fattest) and the bottom two strings (skinniest) in such a way that you can play those strings without them buzzing. Keep working on it until you can hold down all 6 strings and play them without buzzing. 1. Drop Your Wrist-- You may be tempted to "sqeeze" the neck between your index finger and the heel of your palm. If you let yourself do that, it will frustrate you! Instead, drop your wrist away from the back of the neck and let the thumb make the contact with the back of the neck. 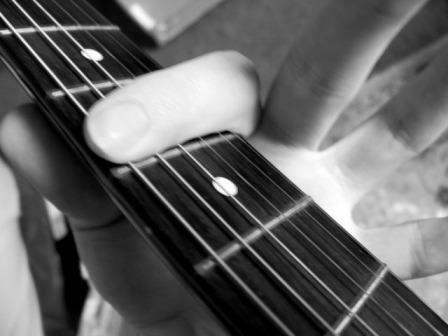 This will be counter-intuitive, but it's the only way to form a good barre chord. 2. Keep the Index Finger Straight-- If you've done the exercise above, you'll be able to do this pretty quickly with no problem. The good news is, once you have this down, you'll be making barre chords with more ease than even a lot of the open chords you're used to. I remember feeling like an outsider when I was just getting started playing. The "cool" guys knew how to do barre chords and I still found them impossible. I wish someone had told me what I just told you. I could have been jamming along, playing "Proud Mary" right along with them (even though I didn't have the right haircut).